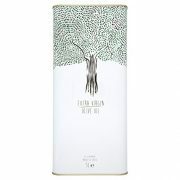 «Chios Mastiha: A tear that pleases, perfumes, relieves, heals!» Chios Mastiha is the name of a resinous sap produced from the mastic tree (Pistacia Lentiscus var. Chia). It is a natural, aromatic resin in teardrop shape, falling on the ground in drops from superficial scratches induced by cultivators on the tree’s trunk and main branches with sharp tools. As it drips, this sap appears as a sticky and translucent liquid which, 15-20 days later, is solidified into irregular shapes influenced by the area’s weather conditions in summertime, that is intense drought and sunlight. After being solidified, it has a crystal form, while its rather bitter taste quickly subsides to leave a distinctive aroma that really makes it unique. 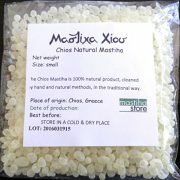 That solid product is then harvested and washed by mastic growers, giving us finally the natural Chios mastiha. Its colour is initially ivory-like but as time goes by, that shade is lost and 12 to 18 months later it changes into yellowish due to oxidation. It is made of hundreds of components, among which only 80 are contained in identifiable quantities. 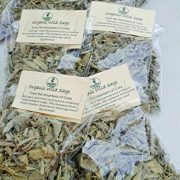 Such multitude probably justifies the multiple uses of Chios mastiha, in the fields of food industry, health and cosmetic care, worldwide. 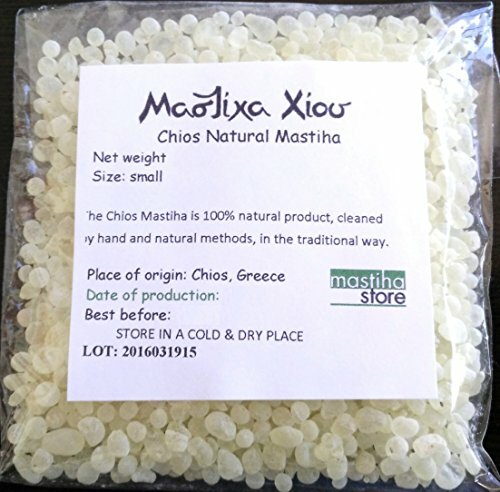 Chios Mastiha is a unique product with many beneficial qualities and wide- ranging uses since antiquity. Nowadays, it is used in pharmaceuticals, perfumes, cosmetics, beverages, bakery goods, sweets as well as in cooking. Chios Mastiha is the natural resin of Pistacia lentiscus var. Chia, a tree which grows only on the Aegean island of Chios, Greece. Scientific research shows that Chios Mastiha has anti- microbial, anti- inflammatory, and healing activity. Also, it has beneficial effects on both body hygiene and skin care. 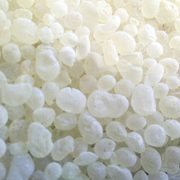 You can use mastic as ordinary chewing gum, or you can grind it into powder and use it as a natural medicine for peptic ulcers and general for stomach disorders. 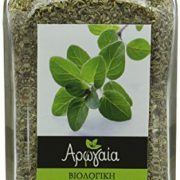 Chios Mastiha is a unique product with many beneficial qualities and wide- ranging uses since antiquity. Nowadays, it is used in pharmaceuticals, perfumes, cosmetics, beverages, bakery goods, sweets as well as in cooking. Chios Mastiha is the natural resin of Pistacia lentiscus var. Chia, a tree which grows only on the Aegean island of Chios, Greece. Scientific research shows that Chios Mastiha has anti- microbial, anti- inflammatory, and healing activity. Also, it has beneficial effects on both body hygiene and skin care. 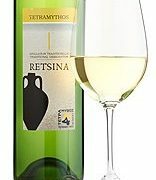 Tetramythos Black of Kalavryta 2015 ORGANIC Greek red wine made in the most natural way! Features Authentic Greek taste in your cuisine. Exceptional taste and freshly-cut aroma. Carefully hand-picked when perfectly ripe to maintain aroma. Traditionally “air-dried” . Organic cultivated.